Born in Ecuador and raised in the Bronx, Oscar Bermeo is the author of four poetry chapbooks, most recently <i>To the Break of Dawn</i>. He now makes his home in Oakland, with his wife, poeta Barbara Jane Reyes, where he co-edits Doveglion Press. Oscar has been a featured writer at a variety of venues and institutions including the Nuyorican Poets Cafe, Kearny Street Workshop, Rikers Island Penitentiary, San Quentin Prison, UC Berkeley, UNC Chapel Hill, NYU and many others. 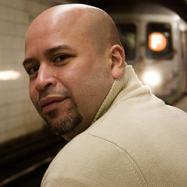 Oscar is a BRIO (Bronx Recognizes Its Own), CantoMundo, IWL (Intergenerational Writers Lab) and VONA (Voices of Our Nations Arts Foundation) writing fellow. Finalist 2008, 2010 Andrés Montoya Poetry Prize; 2004 BRIO (Bronx Recognizes Its Own) winner for poetry; Honorable Mention, Kulupi Press’s 2007 “Sense of Place” chapbook contest.